Get off the interstate and opt outside with a stop in Munfordville! Exit 65 off I-65 offers a diverse amount of Trail Town activity. All activities listed are located at the Green River Park & Arboretum at Stovall Park, tucked under the 31-W bridge. Canoe or kayak the Green River! Our local outfitter, Big Buffalo Crossing Canoes & Kayaks, can rent you something to just paddle upstream a little ways, or can be your livery for a trip as short as a couple of hours. 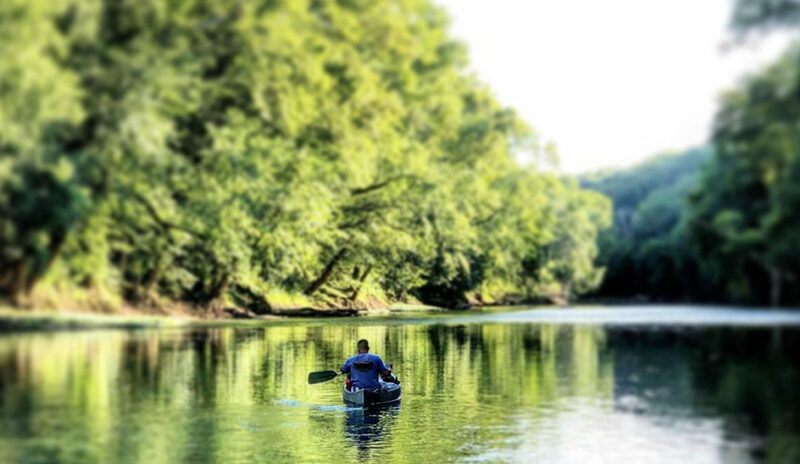 There are four days worth of canoeing on the Green in our area, from Lynn Camp Creek through Mammoth Cave. Just down from Lynn Camp is 300 Springs, a waterfall only accessible by boat. Have a picnic & enjoy the playground! It’s old school. Grab some take out from our local restaurants or grocery and enjoy the outdoors while you eat. If grilling sounds better to you, there are also grills beside the picnic shelters at the park. We have a playground and even swings near the picnic shelters. Play a round of disc golf. We have 9 holes, reviewed as beginner friendly. The course winds throughout the park and along the river. Discs are available at our Welcome Center on Main Street if you didn’t bring any along. Get those steps in! Walk the paved trail at the park. It’s easy to get in a couple of miles, or just get a little stretch if you are making a quick stop. If hiking is more your game, take the Jenny Wilson Byrd Trailhead at the east end of the park. The trail is 4.5 miles and is along the river banks of the Green River. You can turn back whenever you’re ready, or have someone shuttle to Johnson Springs for pick up if you want to hike through. If your ready to settle down for the night, you could camp or hang a hammock in the park. Camping is primitive and there is no fee.